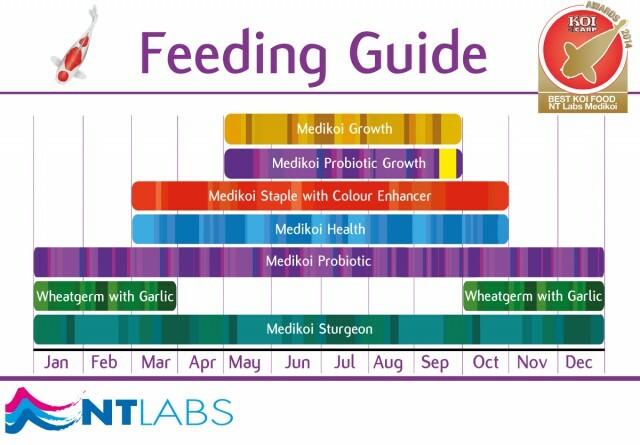 Medikoi Wheatgerm with Garlic is an ideal food for late-Autumn, Winter and Early Spring feeding. The reduced protein results in less waste produced by fish with a slower Winter metabolism. The inclusion of garlic stimulates the appetite of fish, and the sulfur-rich compounds in garlic can permeate a fish’s skin. Garlic is well-known for repelling skin parasites such as white spot, flukes and fish lice which can attack vulnerable, overwintering fish. Feeding during the cooler months to ensure your fish get the right nutrition and support when they need it. Wheat Flour, Wheatgerm, Wheat Bran, Maize Gluten, Soya, Garlic, Fish Oil. Protein 20%, Oil 5%, Vitamins 4.3 Mcal/kg, Garlic 1500 Mg/kg, Minerals. Vitamin A 21000 IU/kg, Vitamin C 150 Mg/kg, Vitamin D 1500 IU/kg, Vitamin E 150 Mg/kg. EEC Permitted Preservatives and Antioxidants.